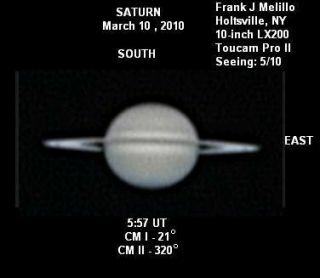 A recent image of Saturn taken by Frank J. Melillo of Holtsville, NY using a 10" LX 200 telescope with a Toucam Pro II. While the planet Venus is now gaining in prominence low in western evening sky and Mars continues to slowly fade as it recedes from Earth, another bright naked eye planet, Saturn, is now enjoying its finest month in 2010. The great ringed beauty arrives at opposition to the sun on the American evening of Sunday, March 21, putting on an all-night performance. On that night it will appear to rise as the sun sets, reaching its highest point in the southern sky at midnight and setting as the sun rises. It's now mimicking a golden-yellow "star," glowing sedately at magnitude +0.5 and is positioned against the string of faint stars that the ancients visualized as a shawl draped over the shoulder of the only zodiacal sign represented by a female: Virgo, the Virgin. Saturn is positioned roughly midway between two bluish first magnitude stars. Spica, the brightest star in Virgo lies off to Saturn's lower left, while Regulus, the brightest star of Leo, the Lion hovers to the upper right of Saturn. Saturn will appear noticeably brighter than either of these stars. Saturn will be in excellent position for observation until at least late June. Thereafter, in the weeks that will follow, Mars, only slightly dimmer, and brilliant Venus, nearly 100 times brighter, will slowly climb up toward it. In early August, these three worlds will appear to cluster together into a "planetary trio," when three planets fit within a circle with a minimum diameter smaller than 5-degrees; indeed they will become most closely bunched on Aug. 8. At that time the three planets will fit into a space comparable to the bowl of the Big Dipper. The three planets then part company and go their separate ways during September. Saturn will drop progressively closer to the sun and will become increasingly difficult to see. The sun itself treads through this region of the sky by the end of September. Saturn will then be unobservable until it ever-so-slowly emerges into the predawn eastern sky toward the end of October. Gradually, it frees itself completely from the glow of morning twilight and will finish out the year rising in the east about a half hour after midnight. Without a question the rings make Saturn is the telescopic showpiece of the night sky. In small telescopes, they surprise observers with their chilling beauty even though it is expected. Any telescope magnifying more than 30-power will now show them quite well. Although visually they appear solid, the rings actually consist of countless billions of particles ? chiefly consisting of water ice ? ranging in size from icebergs to microscopic flecks. Saturn's equator and its rings are tilted at 27-degrees to the plane of its orbit. So there are two opposite points in its orbit, about 15 years apart, where the rings find themselves edgewise to the sun. Saturn arrived at one of these points last year (Aug. 10). From now until May 2025, the sun will be shining on the north face of the rings. But from here on Earth, the view of Saturn becomes more complicated because we're traveling in a much smaller orbit around the sun, so our view of Saturn appears to "oscillate" during the course of a year. Last Sept. 4, the rings were turned edgewise to us. Thereafter, the north face of the rings slowly began to tip in our direction; a white seam bisecting the planet's disk. Up until Jan. 10 of this year, the Earth was seeing Saturn display increasingly widening rings. But since then, the viewing angle between Saturn and Earth rapidly changed as we passed the planet in its much slower orbit so Saturn?s rings have once again been gradually closing. They are currently tipped about 3-degrees to our line of sight, but by the end of May that will have shrunk to just 1.7 degrees. But don't despair! After May 30 they'll begin to widen again and by New Year's Eve, they'll be tilted 10.1 degrees in our direction and will once again provide a stunning view. The rings will finally open to their widest ? a 27-degree tilt ? in October 2017, ensuring that there will be very good viewing times for Saturn in the years ahead.